Wowowow. Paris. Right from the start I knew she’d be a special one. In our initial emails she told me how much she loved other cultures, traveling, vintage, cooking/food, and how she wanted to incorporate all of these into her shoot so that it could be unique! She was also really into being edgy, which is a direction I’m getting more interested in with my photography. Photographing this girl was different and a new experience in itself. Paris brought this high creative energy that pushed and unlocked more creativity in me, which is rare to find. This girl trusted my direction and was down to do anything, which is dream client material!! She also WORKED it in front of the camera. Paris was SO comfortable, probably the most comfortable person I’ve ever shot. It wasn’t just that she was comfortable posing, but was comfortable enough to MOVE by herself. The last thing Paris did was wait for my instruction and stick to a pose for too long, which I LOVE! Every idea I visualized in my head and vocalized, she understood and threw her energy into right away. I only gave a few suggestions throughout the shoot because Paris was hitting most of my ideas and then some! The fluidity and genuineness of her movements brought more variety, authenticity, and energy to her shoot, which I value so much. The pace of our session was fast, so fast that I felt challenged to keep up with her, while also keeping a steady stream of new ideas flowing and watching out for how I was composing each photo. I love clients like these because they challenge me and make me grow into a better photographer. Paris has so many exciting, new adventures coming up for her! This summer she will be heading off to a small town in France to live for the next year, and then will be studying at Cambridge University for the following 4 years! Her DREAM has been to live in Europe, and I find it so brave of her to leave the states at 17 to pursue this dream. After talking to Paris’ mom a little (s/o to Paris’ mom for being so sweet and fun to talk to!! ), I learned that Paris was named after that famous city because it’s where her parents got engaged. And now, after falling in love with the city throughout the years, she is going to LIVE there! For the past two years, she’s visited France multiple times to see her boyfriend, which I find so cool! This girl worked haaarddd for those tickets. We started the shoot out at the National Sculpture Garden by taking a few pictures in her gorgeous prom dress! The next outfit Paris wore was her “vintage” piece! This pink dress was actually her grandma’s old dress altered and without shoulder pads! I love how Paris included such a personal outfit. Paris’ favorite food are macaroons, so when she told me she brought some to include in the shoot, I was overjoyed!! She went all the way into DC earlier that day to buy some from The Sweet Lobby, which apparently has the BEST. Paris has gone to France over 5 times in the past 2 years, so she knows when a macaroon is good!! Paris’ favorite magazine – Bon Appetit! One of her favorite recipes!! After we photographed the macaroons, we finished them FAST. Then we switched gears to a little more edgy. Love the variety in this shoot! This light below is my absolute FAVORITE! A soft glow that warms everything up gently. Morocco has a special place in Paris’ heart. Paris is passionate about Arabic and French cultures, and Morocco is the perfect combination of that for her. When she went there for the first time, she says that she found herself, and would just roam around the streets and markets getting lost in the beauty of it all. During her stay, she would wear djellabas on a day-to-day basis, so she brought one along!! Paris loved the idea of putting the traditional dress against this urban setting, almost as a symbol of rebellion. She also coupled the djellaba with combat boots for the first few shots to highlight this contrast. After our shoot, Paris insisted on taking me out to dinner at this amazing (and pricey!) French restaurant called Table in DC. The setting was intimate, simple, yet very inviting and homey. In 2013 it was selected as one of America’s 50 Best New Restaurants in Bon Appetit. The food was amazing!! The chefs cooked everything in the small dining area, which was so fun to watch. For an appetizer we ordered Serrano Ham from Spain with Langres cheese and crackers. As our main, we ordered roasted rabbit (this was a first for me — I used to own a pet rabbit, eep!! ), which was also delicious! We finished the meal off with a some sort of gourmet chocolate ice cream coupled with hazelnut sponge cake, which was both of our favorites!! Paris is a total foodie and knows her stuff. 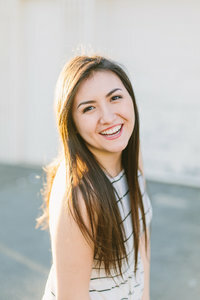 When she was a freshman, she challenged herself to go to 50 of the top 100 restaurants listed in one of her favorite magazines, Bon Appetit, and has almost achieved her goal!! She promised to send me a list of restaurants that I must try and I cannot WAIT! After spending time with Paris, I want start trying new restaurants that have more abstract menu items. I now feel inspired to get out of my comfort zone with food, and become more familiar with food as an art form.